When the Bullocks arrived over 30 years ago, their 5 acres and the 5 adjacent acres they lease were nearly solid Himalayan blackberries, broom, and reed canary grass. They eradicated nearly all of it using non-toxic methods. A few scattered invasives do remain, but if you’d gone to their neighbors’ properties, you’d see broad expanses of the same invasives left to spread rather than being controlled as the Bullocks are doing. Aren’t those the bad neighbors here? The brothers are also working with sterile varieties of broom and Genista hybrids. They are using alders, ceanothus, and other non-invasive N-fixers in addition to brooms, as you suggest. Plus, they restored a wetland that had been illegally drained by the previous owner, which returned otters, raptors, waterbirds, and other native species not seen for decades to the area. 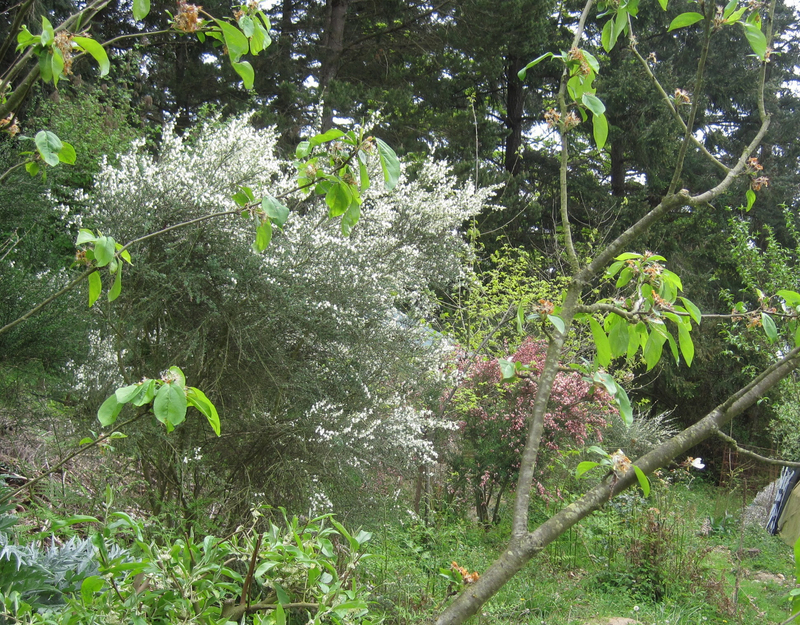 They planted natives extensively to replace the old farm’s exotics, controlled erosion, created huge plantings for native pollinators, and converted a once-monocultured farm containing little but exotic species to one of Orcas Island’s major centers of biodiversity and habitat, education, and a prime tourist attraction. An interesting choice to ignore all that and focus on a wire-caged Scots broom plant. There is much to admire in the physical improvements the Bullocks have made to their site, as you have noted. 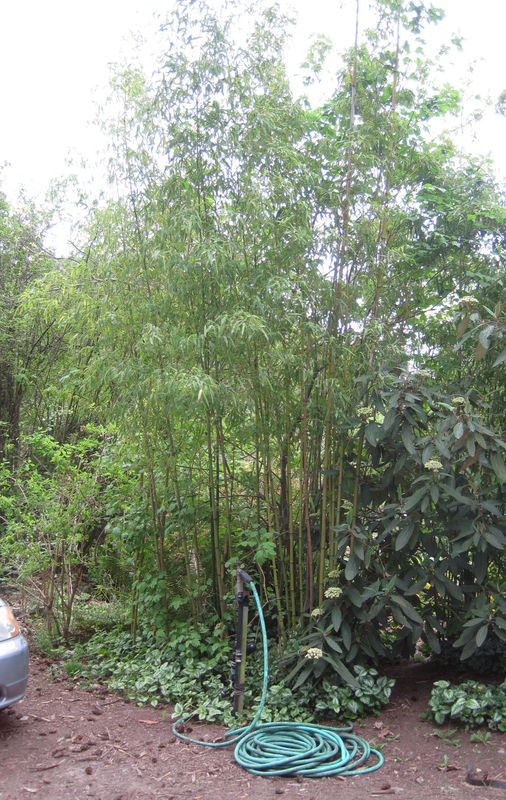 For this particular blog posting, I was focusing specifically on invasive species. There were many, many more brooms on the property than the one companion planting I photographed. And what about the other listed noxious weeds that were allowed to flourish? I was not the only Extension specialist to raise their eyebrows during our visit. I lived on this site for 7 years. I was very surprised to read what you’ve written here as it clearly demonstrates that you did not bother to ask questions while you were on the site (not exactly the mark of “good science”). You provide no context, just photos that demonstrate your predetermined message. Interestingly, that message (invasive species are bad) is only tenuously related to your title. I’m not actually sure your content even tries to prove your title statement. 1) The Scot’s Brooms you have photographed (white flowered, red, light-yellow) are all sterile hybrids. They do not, as implied, set viable seed. 2) The bright yellow-flowered Scot’s Broom that you saw is being managed. Had you asked you would find out that we like to wait until it begins flowering, then we cut them with loppers and mulch with them. By waiting until they flower, they are easier to see and we’re less likely to miss one. We always do our best to catch them before they reached the stage of seed ripening. If a seed did ripen and grow, it happened in a cultivated area (remember we mulch with the tops), so we could easily eliminate it. 3) You imply that we are cultivating Yellow Archangel. Again, had you asked you would have learned that it came in on some brush brought home from a landscaping job and we don’t want it there any more than you do. I imagine you also know how difficult to eliminate it is. Regardless of what you think of our “science,” at the end of the day, we do not want to cultivate ANYTHING that is going to make more work for us. That doesn’t make sense. We have plenty of work to do (try to find a farmer who doesn’t). 4) The French Brooms (Genista spp.) have NEVER in 30 years spread a single viable seed. 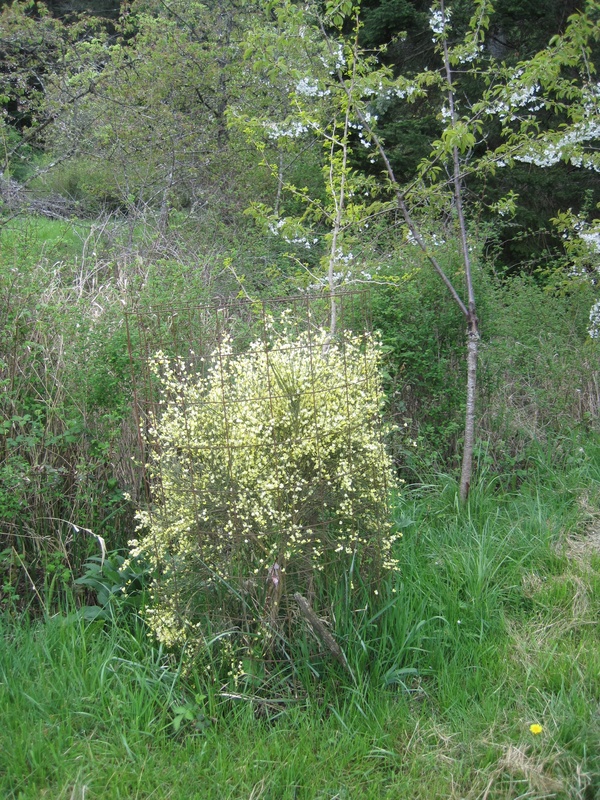 5) We had a single specimen of Spanish Broom on the property for 20+ years. We wanted to propagate it for its amazing fragrance and capacity to build soil, but it never set seed so we could not. It would seem that our particular location does not provide the conditions for Spanish Broom to spread. Should that change we would likely switch to a different species. Again, we aren’t trying to set ourselves up for an extra 4 hour shift of weed management each week, so we’re not trying to spread noxious weeds. The field of systems thinking teaches us that lack of good information for all parties leads to system malfunction (especially true of social systems). If people are only presented with a small portion of the information pertinent to an issue, they often have inadequate information from which to draw a correct conclusion. By omitting the information I have included here, you have presented a problem, identified an enemy, and helped people to conclude that they are wrongdoers. I hope that this easily available information can help to muddy those waters so people do not, as you have intended, believe that all permaculturists are anti-science, spreaders of noxious weeds, and plagues to their neighbors. First, I (and many others in the tour) did ask questions. However, it was not my intention to monopolize the discussion and I did not have the opportunity to ask as many questions as I would have liked. Nor did the WSU weed specialist who was also on the tour and shared my alarm at the WSDA-listed noxious weeds including butterfly bush and holly as well as the brooms and yellow archangel. I was told by our hosts that the broom was being managed, but there was no evidence of any pruning. I don’t know if seed was forming on those plants that I saw at the farm but I know that elsewhere in the islands it was. Second, I’m not going to argue with you about the probability that your other broom species will become invasive. There is a well-known decision tree that helps one predict what plants are most likely to become invasive (Reichard, S.H. and Hamilton, C.W., 1997. Predicting invasions of woody plants introduced into North America. Cons. Biol. 11: 193-203). All brooms are highly likely to become invasive based on their life history characteristics and French and Spanish broom are both invasive in Washington, Oregon and California. Understanding how species become invasive involves understanding that it can take decades for an introduced population to become adapted to local conditions and begin reproducing. You might be interested in UC Davis’ guide to broom management, which pretty much says the same thing. http://www.ipm.ucdavis.edu/PMG/PESTNOTES/pn74147.html. Third, there is no evidence that sterile hybrids will stay that way. “‘Sterile’ varieties of these plants haven’t been independently verified or tested and are not recommended as substitutes” (http://www.cal-ipc.org/landscaping/dpp/pdf/SoCalPrintable.pdf). All of this information is readily available not only from the Internet but from your state Extension specialists, including myself and university weed specialists. Dr. Sarah Reichard at the University of Washington (who developed the decision key I mentioned) is also a resource to you as an international expert on invasion biology. Have you ever contacted any of these experts to discuss invasive plant issues at the farm? If not, I’m curious as to where you obtain the science on the topic. I went and read all your posts on permaculture and quite enjoyed them. I love permaculture–but like anything in the gardening world it is filled with misinformation. I went into it with a horticulture degree and was grateful to that because it helped me ignore and disagree with some of the recommendations and misinformation there. Permaculture is more philosophical than scientific in nature, but is not useless, it simply needs to be used not in place of sound science, but in connection with it. There are some weeds that pop up just because they are weeds…noxious weeds are noxious usually because they spread like mad. I wouldn’t even want to use them because they are often difficult to eradicate (and many support species in permaculture are slated for eventual removal). I agree 100% Liz. I would love to see the permaculture world work with one or more scientists to come up with credible book on science-based permaculture practice. Linda, as you recall, I was standing at your side when we walked through the small orchard where Scots broom was being cultivated as a companion plant to a fruit tree. 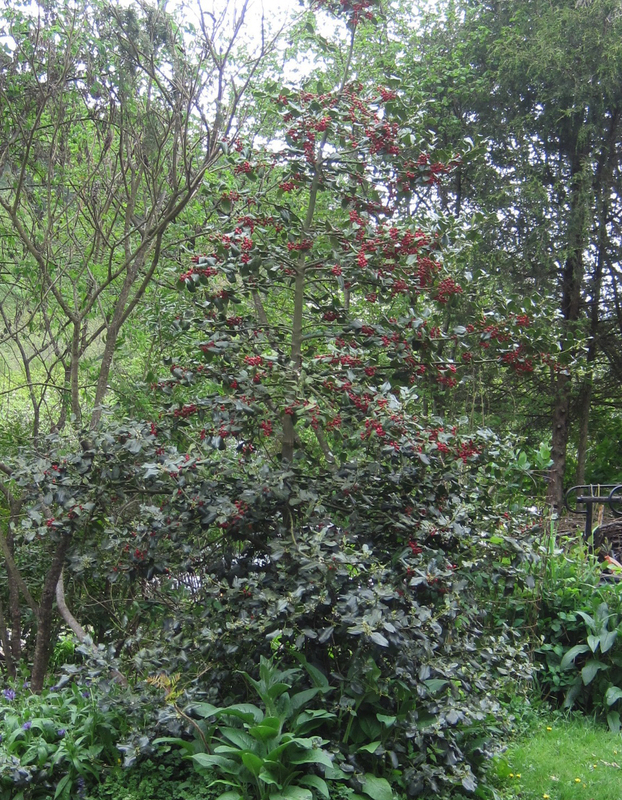 While I acknowledge that it is a listed species, bureaucratic decree does not eliminate any potential benefit that a plant, invasive or otherwise may serve. In the case of the Bullock brothers’ farm, they were cultivating a handful of listed invasives. but, they were doing so intentionally, and for valid reasons (regardless of the legality – which should have little bearing on the ecological context). The thing that amazed me most–after driving around the islands, spotted butter yellow with broom–was that aside from the cultivated/caged broom and a few specimens in other locations, there were no volunteers anywhere that stood out to me. If nothing else, this should speak to the diligence of the caretakers, as well as the ecological knowledge required to prevent such invasives from becoming, well, invasive.